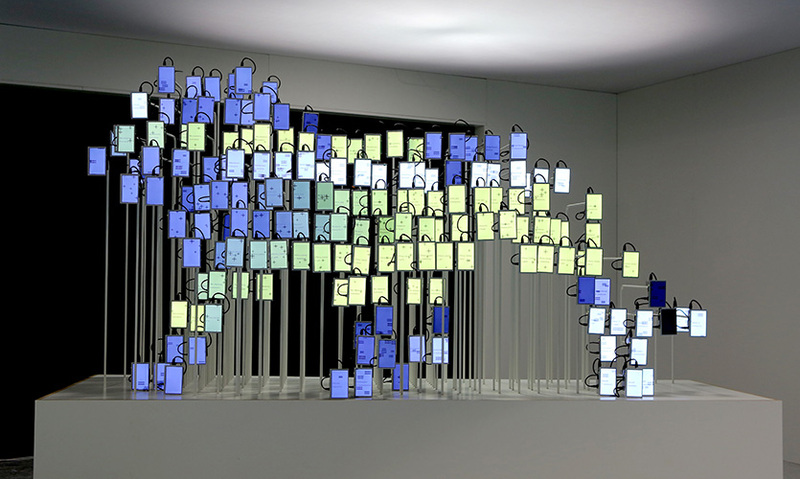 EmotiCannes interactive sculpture at Cannes Lions Innovation Festival in the MEC Palais Cabana, Rotonde Lerins Building. 180 small screens were added to the installation. 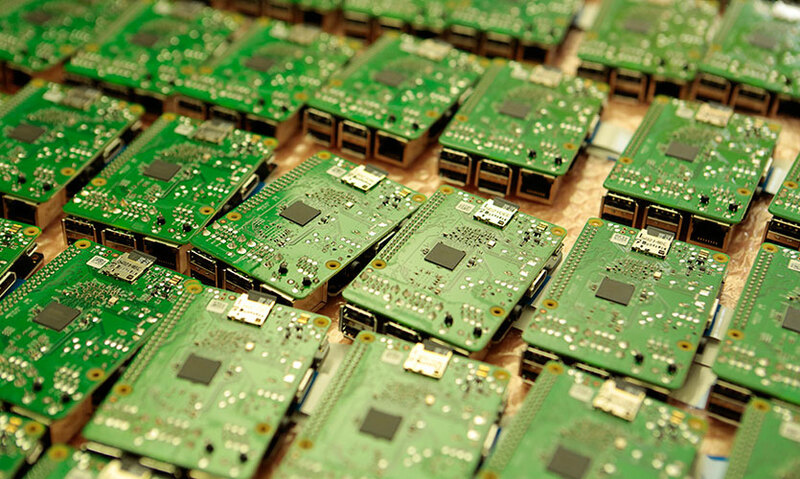 Custom-made Raspberry Pi 2 shields. 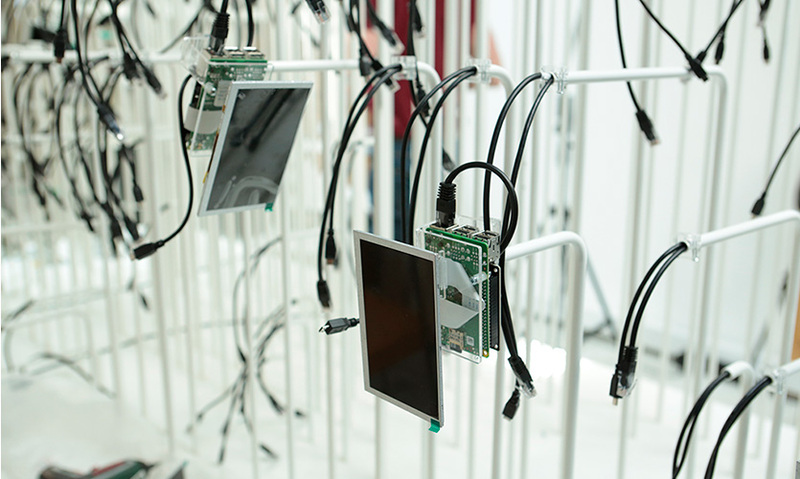 The project used hardware and software including 180 Raspberry Pi 2's. A team member attaches the small screens to create the Lion. Digital content testing was an important part of the process. The team built a custom-made framework and cable network. The completed interactive sculpture in situ. 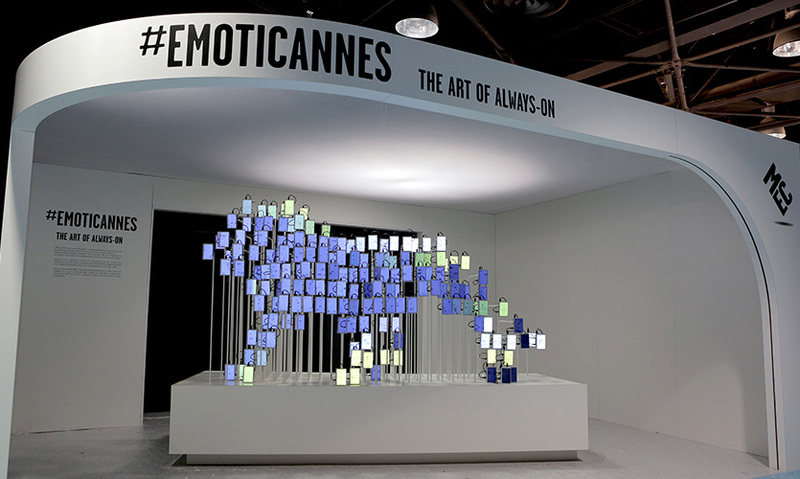 At first view, EmotiCannes is a colorful kaleidoscopic sculpture made up of small computer screens that, viewed from certain vantage points, resolve into a playful representation of the Lion, the icon of the Cannes Festival of Creativity. Streaming live data, and responsive to the people looking at it, 169 screens animate the installation and, on closer examination, begin to reveal EmotiCannes as something much more than zoomorphic art. Designed by Jason Bruges Studio in collaboration with festival sponsor and media planning agency MEC to give physical insight into MEC's social media marketing and real-time data analysis capabilities, EmotiCannes may be a seminal project in the evolution of data visualization in experiential design. 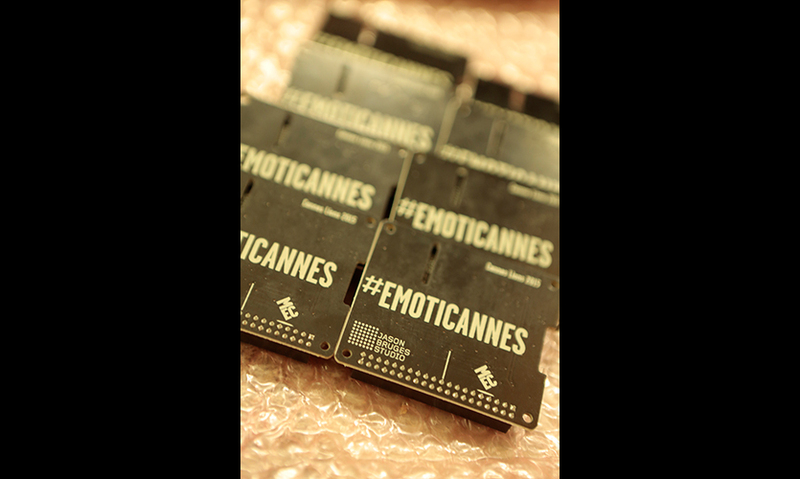 EmotiCannes is a complex fusion of art, interaction design and physical computing sprung from the imagination of the specialists at Jason Bruges Studio, who have created a long line of architectural-scale art and digital design installations. What EmotiCannes did at Cannes places it in a new class of experiential design. A live barometer of emotion, EmotiCannes collected the social media activity of the 10,000+ festival attendees, analyzed that massive amount of data and revealed it in real time as meaningful insights into the prevailing mood of the festival crowd. "Like a chameleon reacting to different stimuli, the Lion shifted and changed its colors and projections in sympathy with the people," says Jason Bruges,interaction designer, artist and founder of Jason Bruges Studio. Those stimuli included tweets from across the festival, coming in through MEC about every two seconds. Each one was graded and weighted as being a positive or negative sentiment. The physical data visualization changed color in response; that informed other aspects, which in turn changed the stream. EmotiCannes is simultaneously sensitive to its viewers: sensors determine a viewer's position, gaze and reaction and add another layer of detailed data to the tweet and to the sculpture. 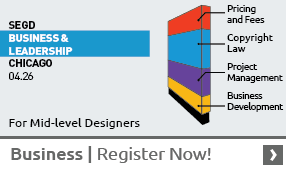 "For us as an art and design studio, it was quite exciting to undertake the dual goals of showing off MEC's capabilities and igniting creative minds to push ideas surrounding data interpretation and visualization. Our work is always about engaging people. The concept that you can engage a crowd, a city, even a country through these unseen conversations was very intriguing." The design challenge was to make the massive amounts of data, which usually display only on a few screens, live and breathe in a physical space. Together with MEC, the design team wanted to create a playful demonstration of how data can be taken out of the computer and into the physical environment. They prepared a series of presentations showing the client different ways of achieving that and eventually worked out the zoomorphic idea using the festival's lion symbol." Establishing the Lion idea was critical. "People are interested in the technology but they still want the narrative," continues Bruges. "They want the story. We thought about things like: How will the story manifest? How will this make people feel? How does the physical manifest? What is the spectacle? What is its scale? And, of course, we also considered how people would move around the festival and how they would interact with The Lion." The technology followed the idea. It was decided early on to use Raspberry Pi individual single-board computers. 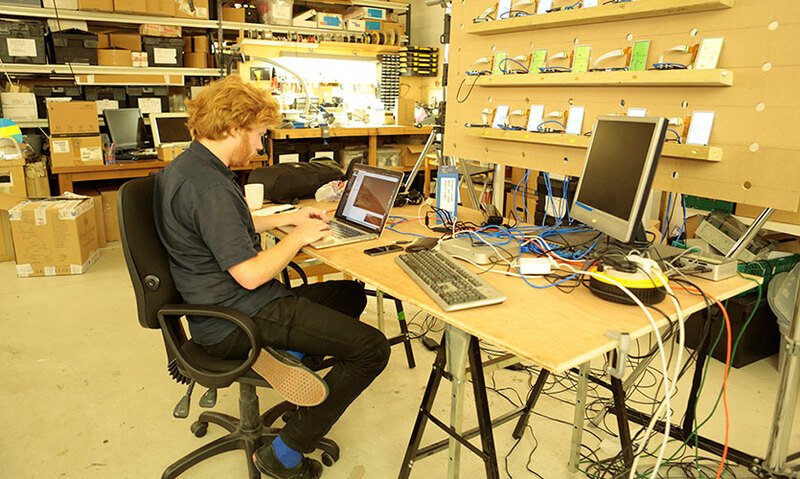 Otherwise, Jason Bruges Studio created entirely custom hardware and software to program each mini-screen individually. 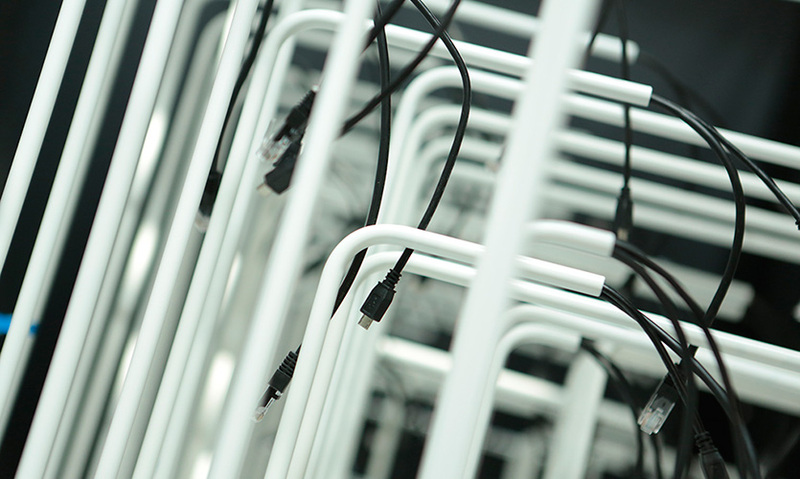 Each display was programmed to be controlled separately or in unison, offering an infinite number of screen configurations; that assured no individual would provoke the same response from the installation. 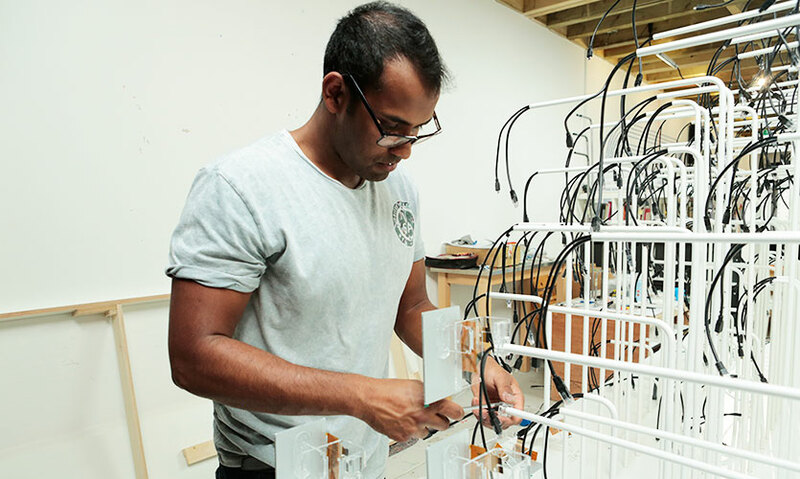 Half of Jason Bruges Studio is a workshop where the team built the prototypes and conducted tests as they designed. "Building and testing were crucial to getting it right," says Bruges. "We built little fragments, checked how far they'd cantilever, how dense they needed to be, how well the form looked, changed the eye level, tested how well information flowed across the surface──all aspects were rigorously interrogated in terms of composition." Over the course of nearly four months, up to 10 people worked on The Lion at any given time. EmotiCannes' design process was highly complex. "The zoomorphism was quite literal and good fun. It was immediately an attractor within the festival. I think people were quite intrigued──a lot of selfies were taken in front of EmotiCannes."